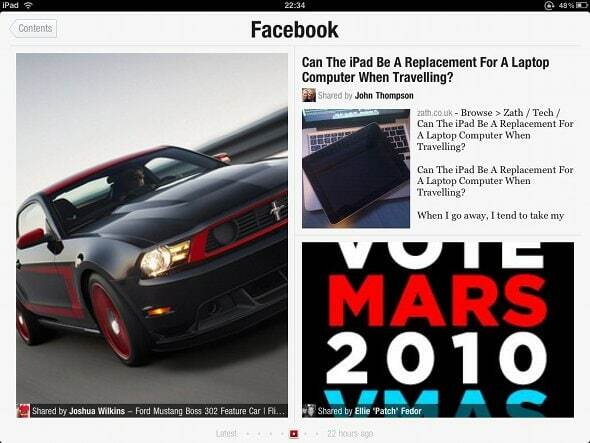 Flipboard is a recent application for the iPad that has been discussed in magazines, blogs, and across the web. With magazines and comics proving to be somewhat popular on the iPad, it was only a matter of time until someone created an application such as Flipboard. So what exactly does it do? Well, Flipboard serves as your own, free tailored magazine on the Apple iPad by taking content from your Facebook and Twitter feeds, as well as a selection of other blogs and online magazines from around the internet and organising them so that they are easy to read and digest. Despite early promise, the app has suffered from some early technical issues, which has prevented most users from entering their social networking details and creating their very own personalised magazine. However, most of these issues seem to have been solved, and I have been using Flipboard ever since I received my confirmation email a few weeks ago. The Flipboard iPad app is organised like a magazine, so the first page that you flip to is the contents. It has a very modular design, like you would expect to see on a Windows Phone 7 app rather than the iPad, but it works really well. By default, you’ll have four Flipboard themes. 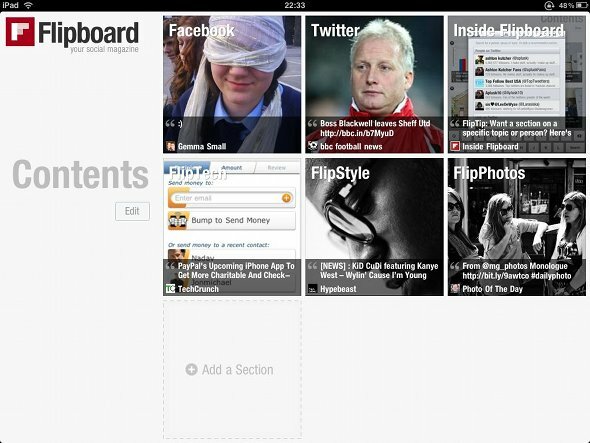 These include Fliptech, FlipStyle, FlipPhotos, and Inside Flipboard. As well as this you can add your personal Facebook and Twitter themes. Beyond this, any other sections that you choose to add are completely up to you. There are more Flipboard options such as news, sports and politics, as well as some really cool feeds such as TechCrunch, Wired and Spacememe. With all these options to choose from, you won’t be hard pressed for content to read again. The only issue I have with the Flipboard sections is that it seems to be limited to 9 selections. After you’ve added your personal feeds, perhaps a couple of specific Twitter List news feeds as well as other curated feeds that interest, you’ll fast be running out of room, so choose carefully until this is rectified! – No doubt this will improve as the company grows. When viewing a particular feed (you can see a page from my Facebook feed below), the content will be ordered by the time in which it was published. This means that the closer you are to the front of the section, the more recent the posts will be. It goes back quite far in time, so you’ll be able to view a selection of posts from the past 24 hours or more in most cases. Your feed, like the contents, will be displayed in a modular layout, with some pages focused on status updates (or tweets, if you’re viewing Twitter), and others displaying a selection of photos and content from links that your friends have posted. This is great, as it adds a lot of variation to the content that you’re currently viewing, and keeps everything interesting. If you see a post that you’re interested in, you can simply tap it to see how many people have liked it and all the comments on it, too. Likewise, you can expand posts by tapping on them as well. If you want to view the full post or article, you can view it on the web too – which is good for you and content publishers as you then get to see the original website. 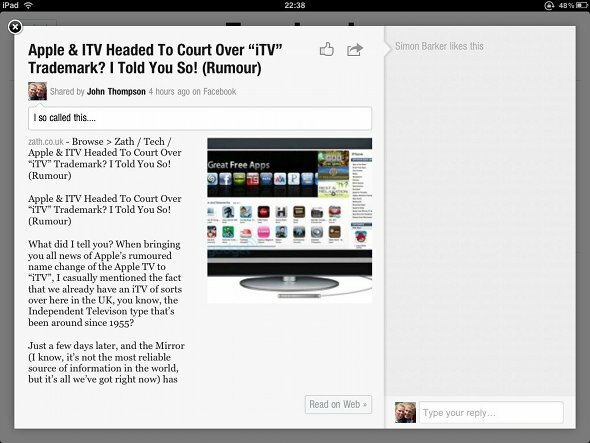 All in all, Flipboard is clearly tailor made for the iPad. With the large display, it works really well and offers to show a plethora of content from feeds across the web. It’s a free download from iTunes, so go try it out for yourself!